With gift-giving season around the corner, I’m sure the pressure to find something ‘perfect’ for everyone on your list without breaking the bank is on your mind. Hello Black Friday shopping!!! But as I’ve gotten older, I seem to have lost the pleasure in giving & receiving store bought gifts; I mean, doesn’t everybody have enough ‘stuff’ already? In the last 2-3 years, unless I find something that I am pretty certain the recipient will love. I would rather give flowers or home-made edibles or even an experience (movie/dinner/museum out together) than another candle/bowl/you-name-it item that’s pretty but will probably be re-gifted or sit in the basement. This drives my family crazy!! 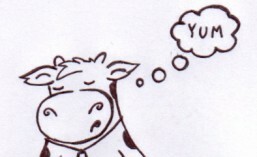 Gift-giving occasions are a pain-in-the-*** for them because they really need to think about it :)). For me, it’s not how much the gift is worth in $$ but how much thought went into it. Along these lines, when I had a certain (ahem!) milestone birthday a few years ago, I was treated to a fantastic trip to Morocco – one of my ‘places to visit before I die’. What an experience!!! The scenic beauty, the people, the food, the history & culture is definitely one I will never forget. 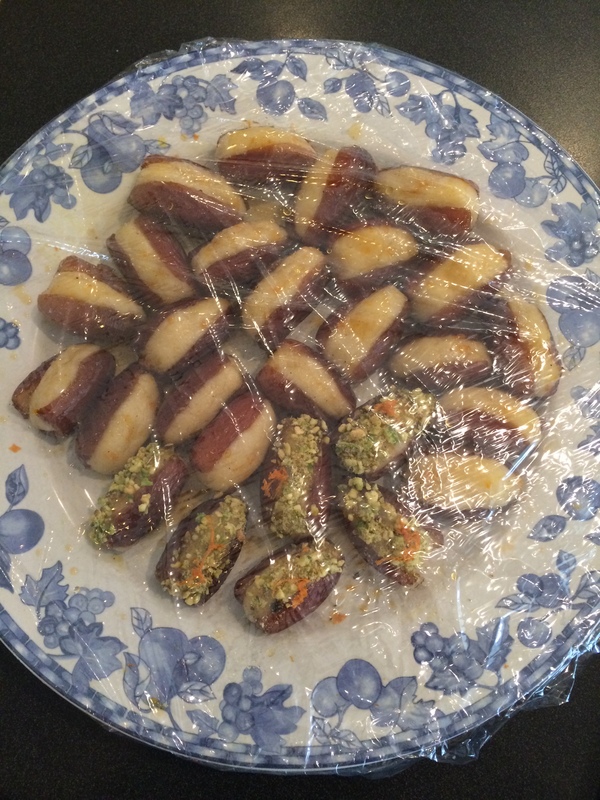 I will do a small post on our trip soon and share photos, but I wanted to share this recipe for yummy Stuffed Dates that we were offered with mint tea in some of the places we stayed. While it probably isn’t authentic Moroccan, my recipe below has blended several recipes I’ve come across, with a touch of Indian. Hope you enjoy it. You can find Orange-Blossom water in any International or Middle Eastern grocery store for around $2-$3. If it is not readily available, you may substitute Rosewater (more readily available at any of the above or Indian grocers). 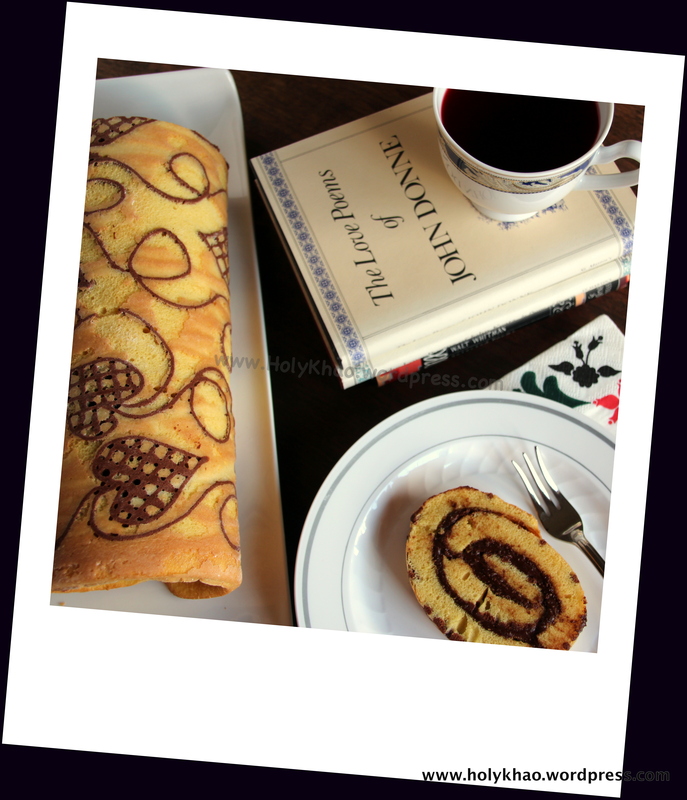 Please read the bottom of this post for how to make Rosewater flavored stuffed dates. 1) Boil 2 cups of water in a small bowl and remove from stove. Drop the almonds in the hot water and let it sit for about 5 minutes. 2) In another small saucepan, bring the orange juice, honey, 1 Tbsp orange-blossom water, orange zest (if using) & cardamom to boil on medium heat, then simmer for about 5 minutes, stirring occasionally. Set aside to cool completely. 3) Meanwhile, toast the pistachio nuts in a pan on medium-low heat, stirring constantly to avoid browning – about 3-4 minutes. 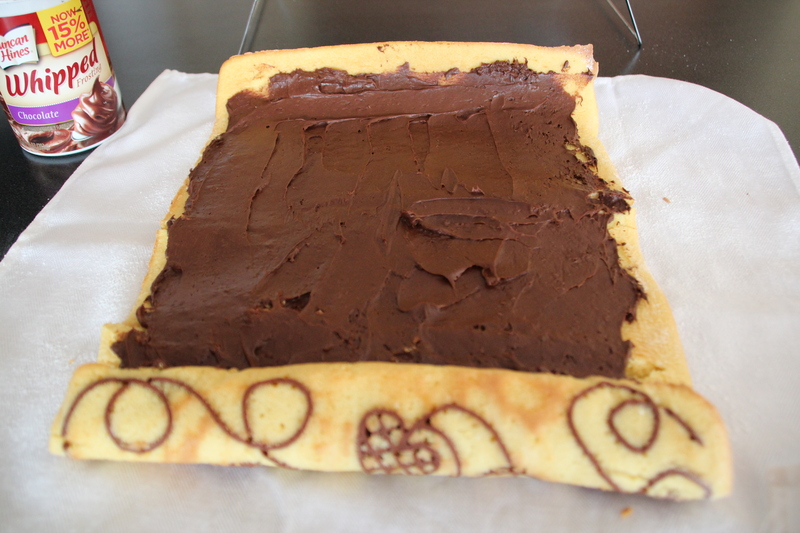 Pour into a wide plate in a single layer to cool completely. 4) Now drain the almonds and pinch between your thumb & forefinger to remove the skin – it should slide off easily. (Check this video if you’ve never blanched almonds before.) Drain well and cool completely on a plate. 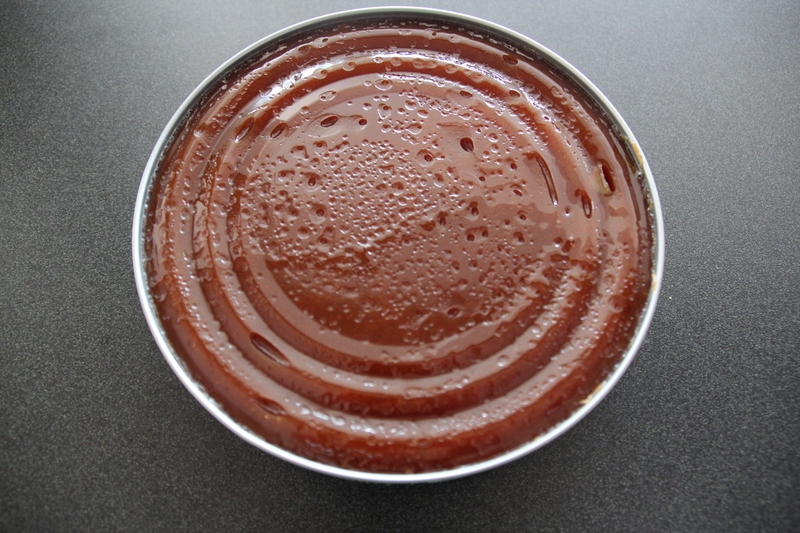 5) Gently slit the dates down one side and remove the pit – do not cut all the way through into halves. Set aside on a flat plate. (I buy pitted dates from Costco). 6) Coarsely chop the pistachios in a small food processor jar and set aside in a bowl. 7) In the same jar, combine the blanched almonds, powdered sugar and 1 tsp of blossom water and process till the almonds are ground fine. You may need to add another teaspoon or two of blossom water to help the mixture come together like a ball, but add only as needed or the paste will become too sticky. (I needed 3 tsp). Do not over-process. 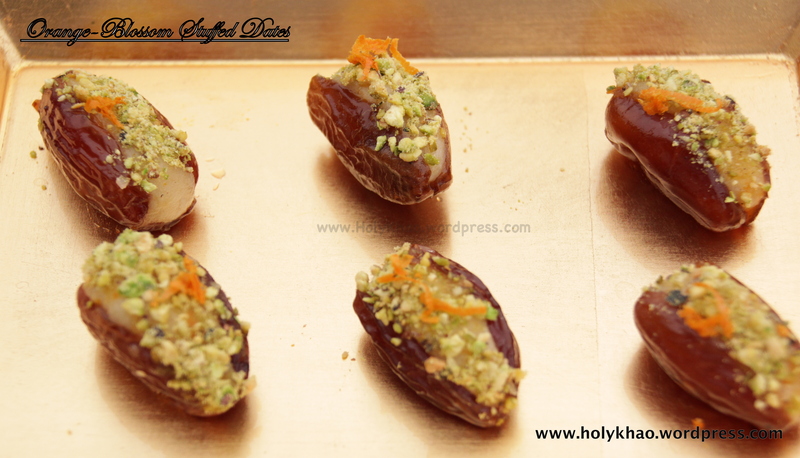 9) Stuff all the dates with the almonds and gently press into shape with your fingers. Set aside on the flat plate. 11) Before serving, brush with the dates with the remaining syrup. 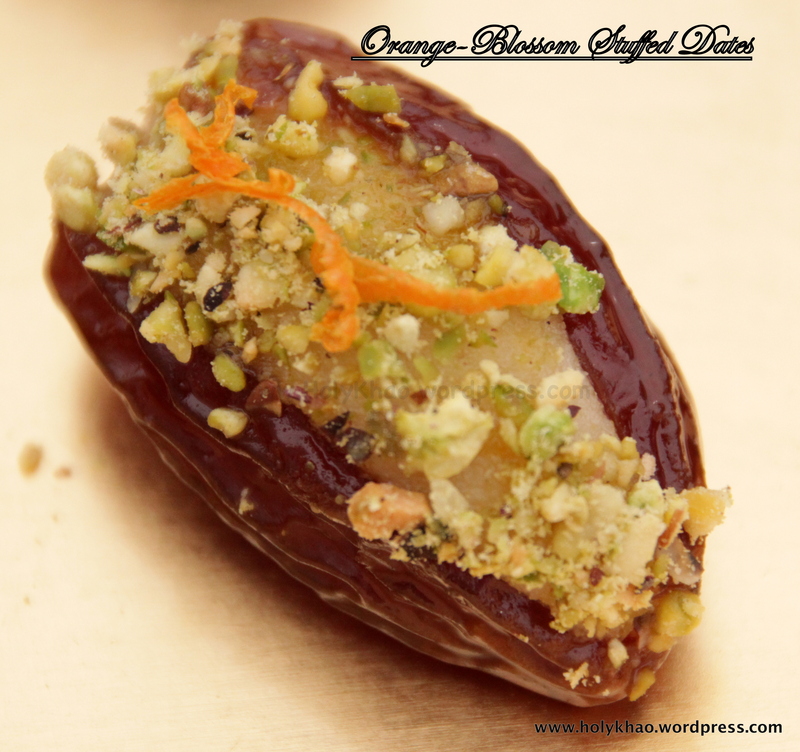 Lift each date, and holding upside down, gently roll in the chopped pistachios and place on serving platter. Top with orange zest (optional) and serve at room temperature. 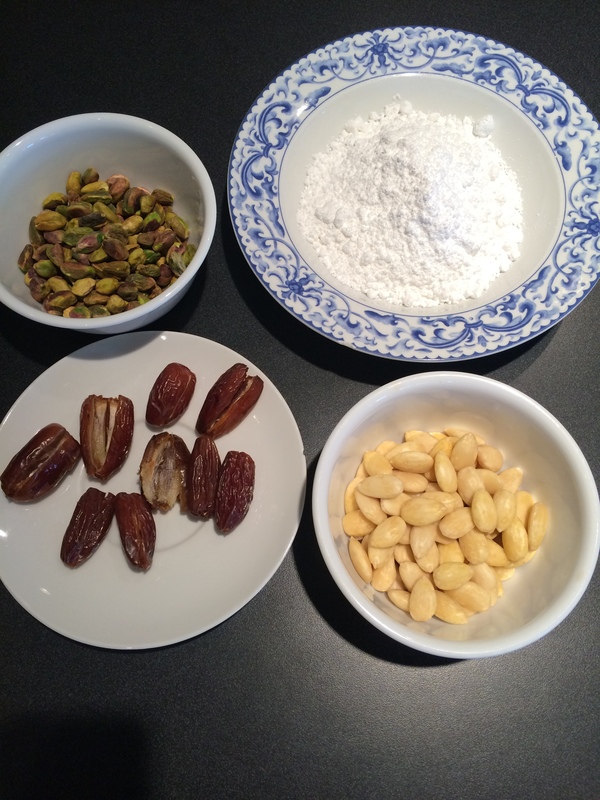 1) Process the almonds, sugar and rose syrup to form a paste (step 7 above). 2) Roll into logs & stuff the dates with the paste. 3) Make the syrup with 1/4 cup water + 1-2 Tbsp honey + 1 Tbsp rosewater (step 2 above). Skip the cardamom is you feel it will overpower the delicate rose taste. 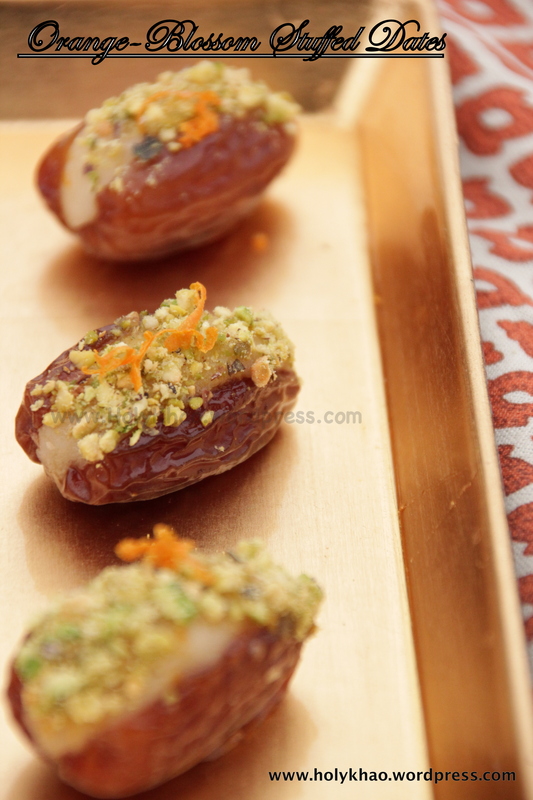 4) Brush the stuffed dates with the cooled syrup, roll in chopped pistachios and serve at room temperature. 5) If you serve each date in an edible rose petal, it should make for a spectacular presentation. Alternately, arrange some dry edible rose buds in the serving platter for some wow factor. Here’s a dessert that I’ve made dozens of times and it has always brought rave reviews. Thanks to my aunt Uma for the recipe. 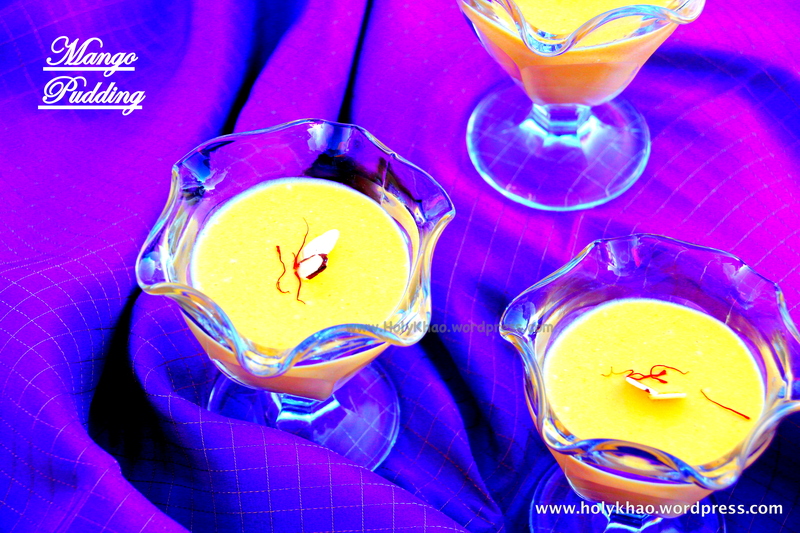 Super easy to whip together, Mango Pudding can be made a day or two ahead, and will keep refrigerated for a couple days if covered tightly. 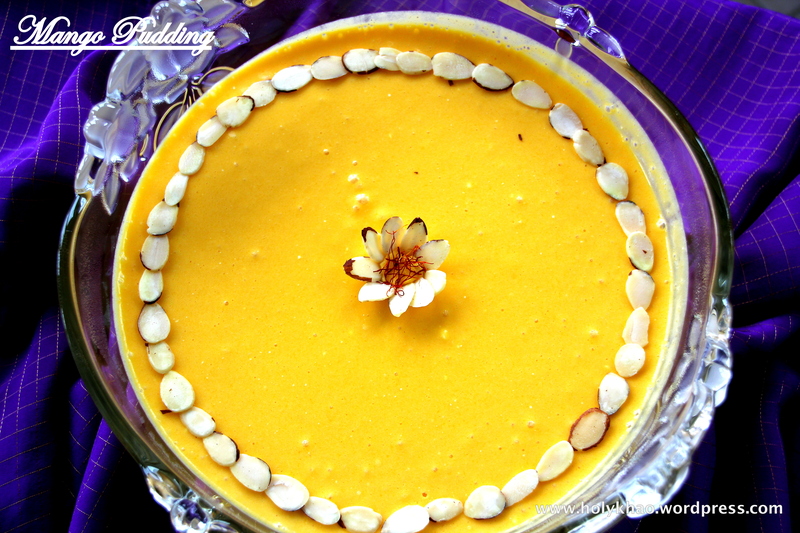 This is a great dish to take for pot-luck meals as it travels well; no sloshing and spilling on your party outfit :)). 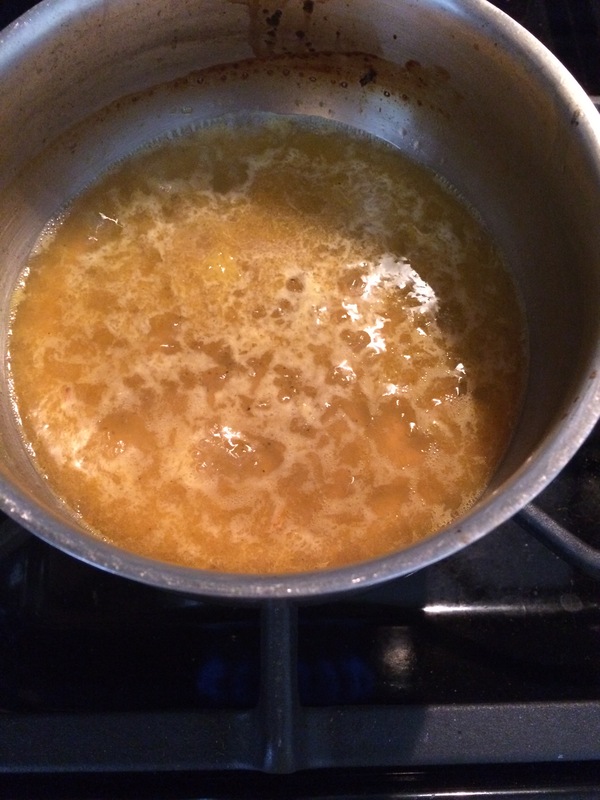 1) Boil 3 cups water on the stove and stir well to completely dissolve 3 packets gelatin in it. Cool till luke warm – about 10 minutes. 2) Meanwhile, in a large round bowl (at least 4 quart/4 liter capacity), add the cream cheese and beat with a hand blender till smooth. 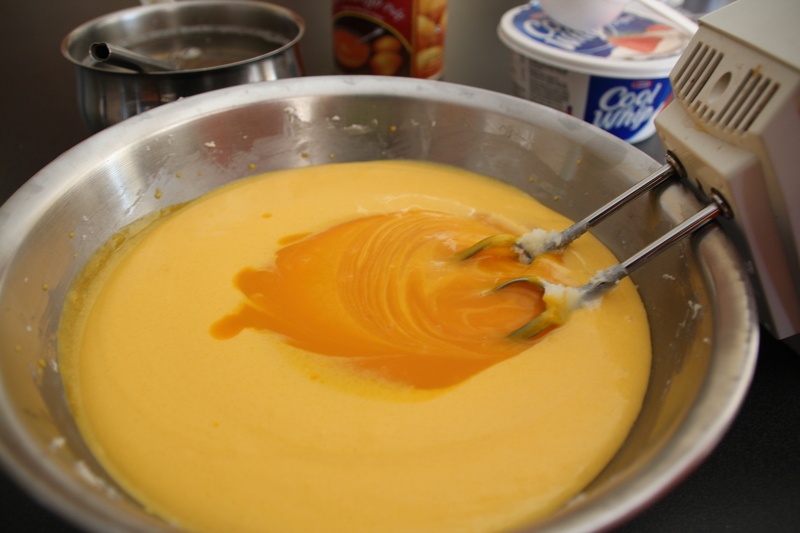 3) Add the sugar and blend with the cream cheese till light and fluffy, and well incorporated. 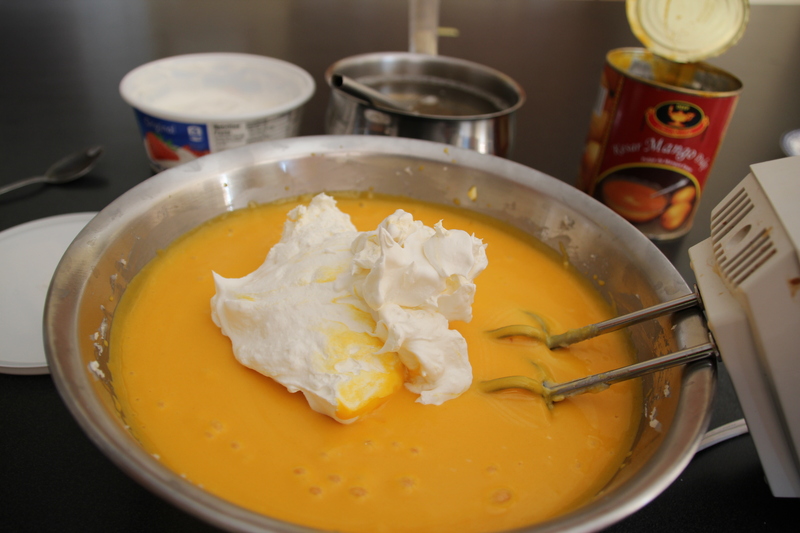 4) Add the mango pulp and CoolWhip – a little at a time – and beat well till no lumps remain. 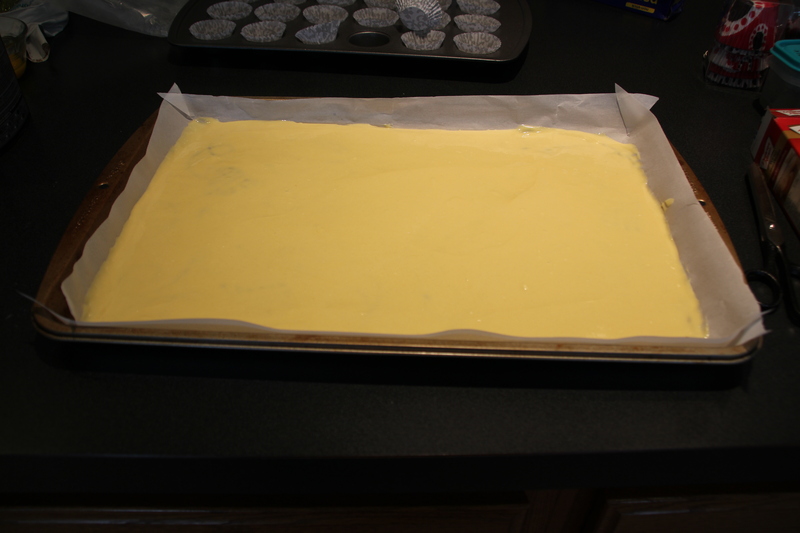 Scrape down the sides if necessary and mix well with the sugar-cheese mixture. 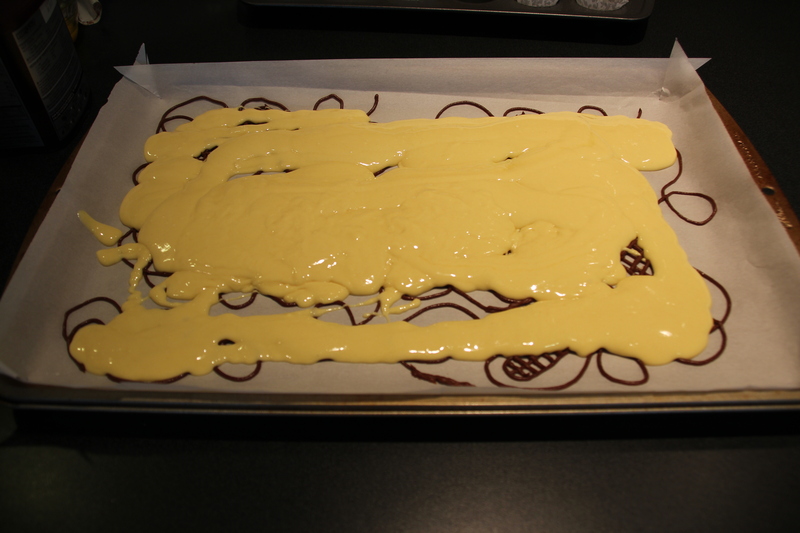 5) Now slowly add the cooled gelatin in batches and make sure to thoroughly mix it with the rest of the ingredients. This step is important for the entire dish to set. 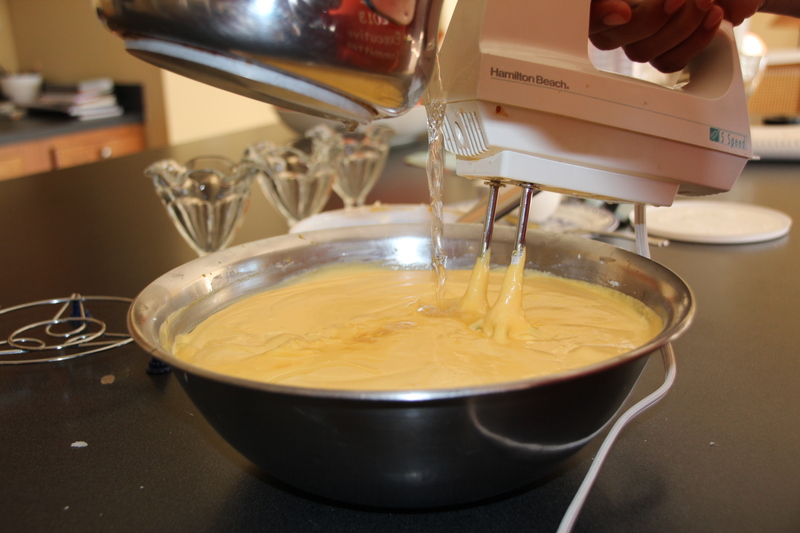 6) Pour into a 3-quart serving dish or into individual serving cups and chill till set, at least 6 hours or overnight. 7) Garnish with more Cool Whip, chopped nuts or saffron before serving. 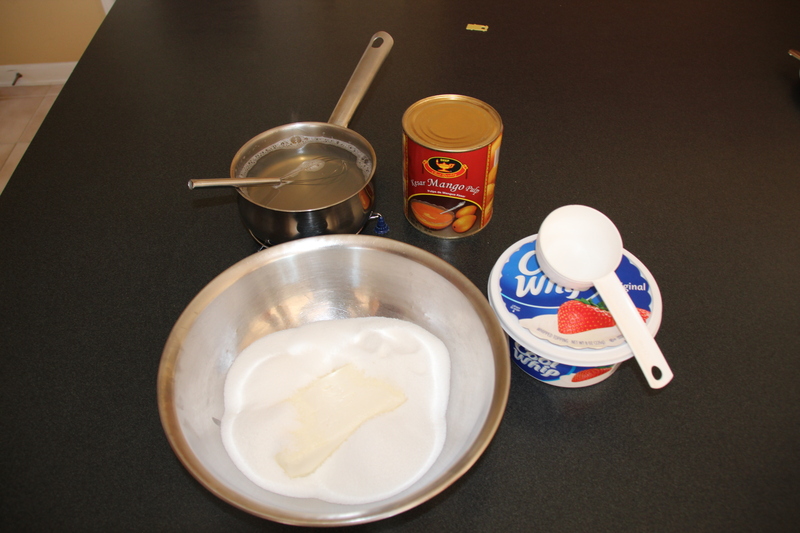 TIPS: Do not use hot gelatin water as the rest of the ingredients will change consistency. 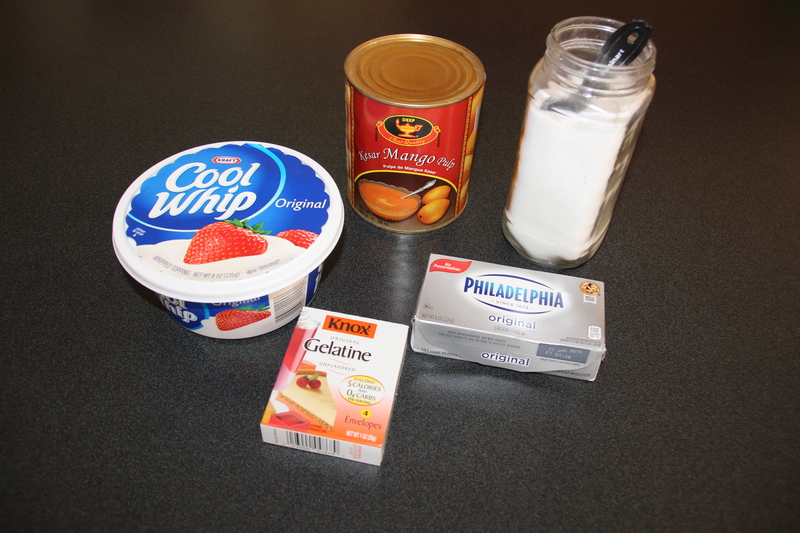 Make sure to add a little pulp at a time while beating or else the cream cheese will ‘ball’ and leave lumps. Mix the gelatin well with the rest of the ingredients for consistent consistency. If bubbles form while transferring into a serving dish, they will set and look weird (in my opinion – but then, I’m finicky like that!) 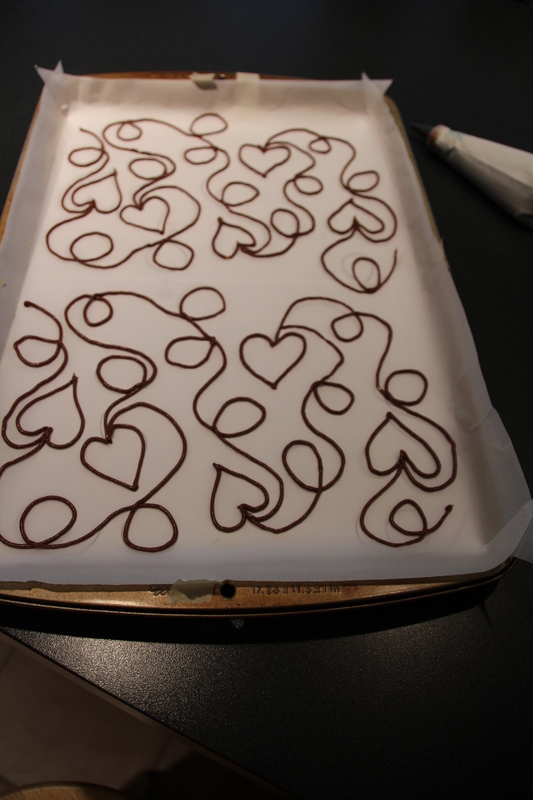 Pour gently or spoon the mixture into your serving dish and shake out the bubbles if you see them. Garnish only after the pudding has set. 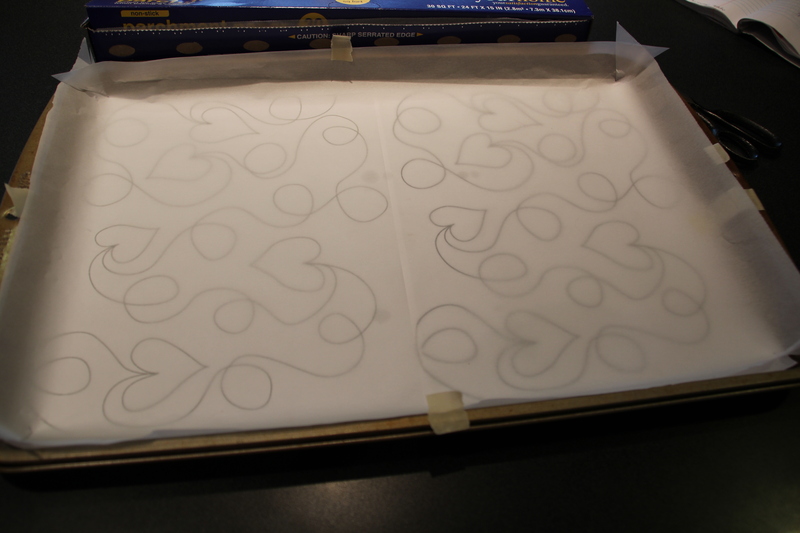 While this looks like a lot of steps, it is surprisingly easy to make and is totally worth the effort. Hope you enjoy this pudding, and leave some feedback on how it turns out. Fall!!! My favorite season of the year. Everything around is fresh and crisp and clean. I love the cool breeze, the vibrant colors on the trees, hot chai, the holidays around the corner (that brings with it it’s own madness, but in my mind’s eye, everything is perfect & organized :)). As the weather starts to cool down, I have had hankerings for fried, starchy, savory snacks for the last few days. 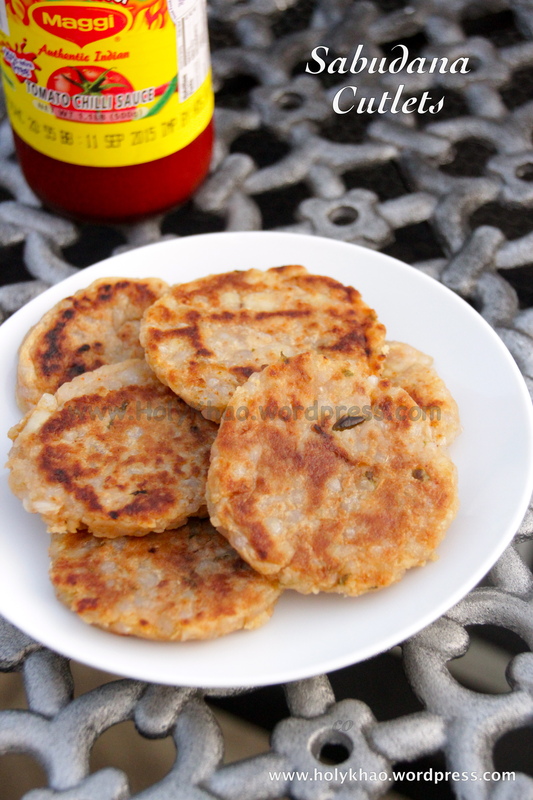 Not to mention that everywhere I turn (maybe I should say, click), I see Navratri recipes, with sabudana vada being the most posted. A friend of mine makes the best ones that stay crisp even after they cool – stay tuned for her recipe here soon. In the meantime, I wanted to make a quick and lighter version. 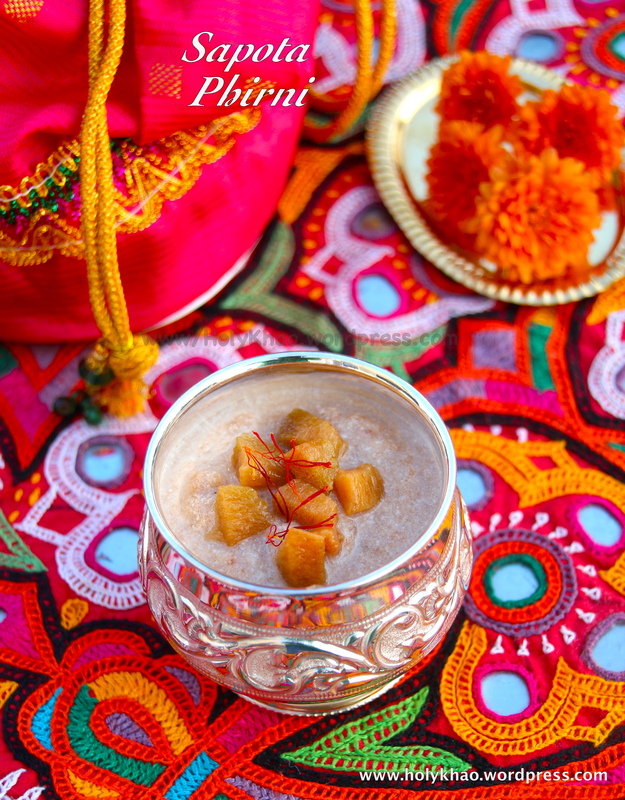 Incidentally, a bag of frozen sapota that I had bought on an impulse kept staring at me for the last few weeks, and I figured Sapota Phirni would be an interesting accompaniment to the vadas. 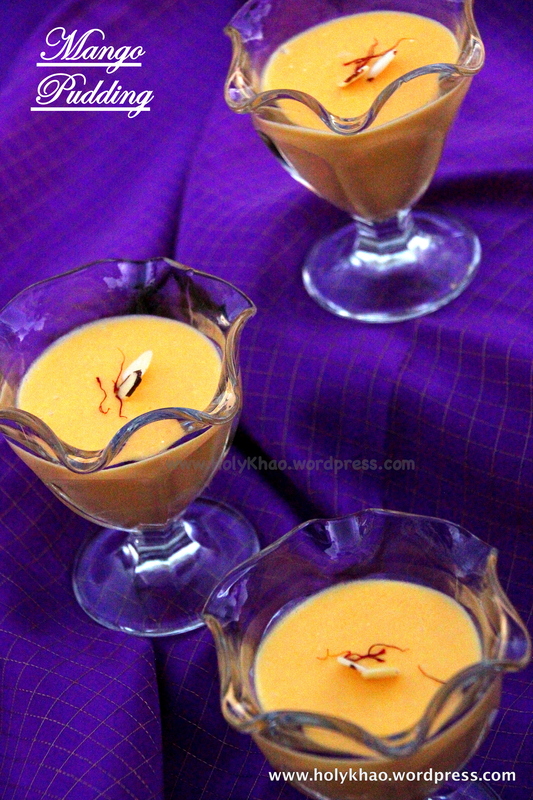 I figured that my Almond Phirni method would work here too. 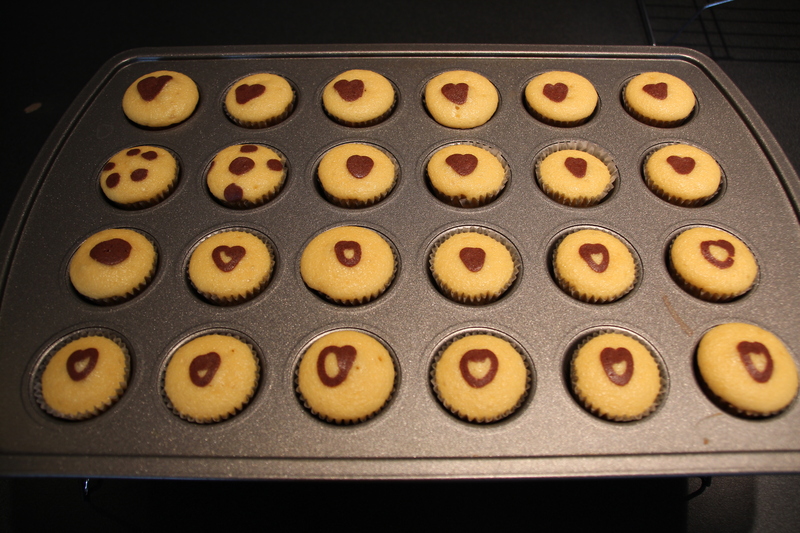 While I did have reservations about how it would taste, let me just say that they both turned out well. 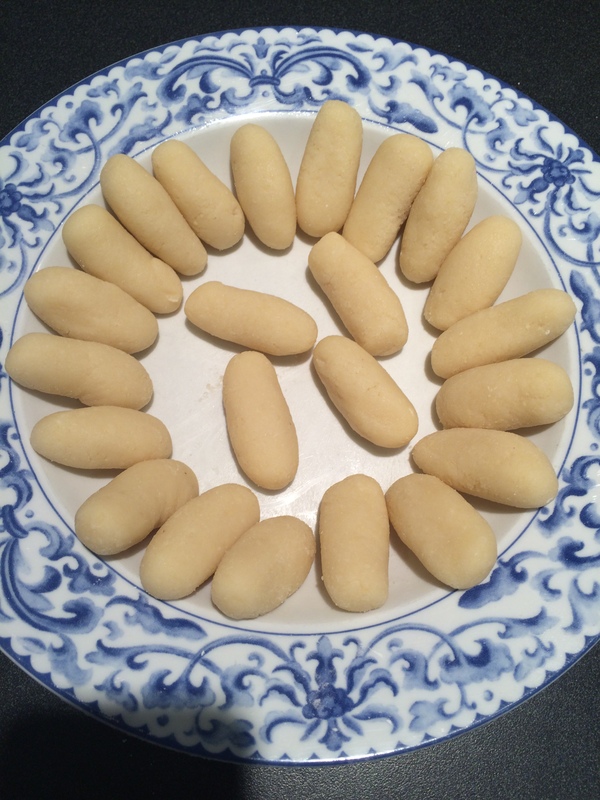 1) In a small bowl, stir together the rice flour and 1/2 cup milk, making sure there are no lumps. Set aside. 2) In a medium bowl, heat the remaining 1 1/2 cups milk and sugar on medium till it comes to a boil. 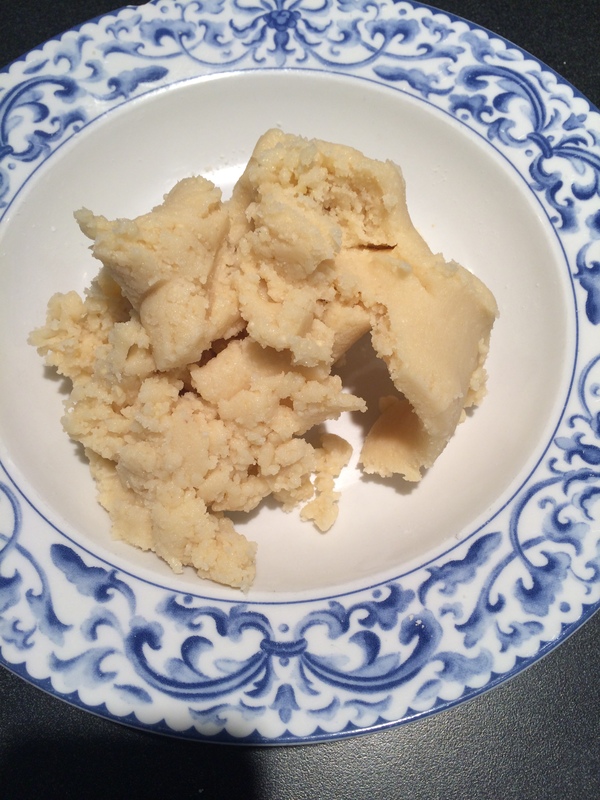 3) Reduce the heat, and slowly pour in the rice flour mixture, stirring vigorously to make sure that no lumps form. 4) Add the cardamom powder and saffron, and simmer for 5-7 minutes. 5) Stir in the sapota puree and simmer 1 minute. 6) Remove from heat and cool to room temperature, or chill. 7) Top with roasted and chopped nuts and raisins before serving (optional). 1) Rinse and soak the sabudana in water for 4-5 hours or overnight (each batch varies in how quickly it softens; when ready to use, the sabudana must be easily squished between your fingers). 2) Drain the sabudana well in a colander, and make sure it does not have excess water. 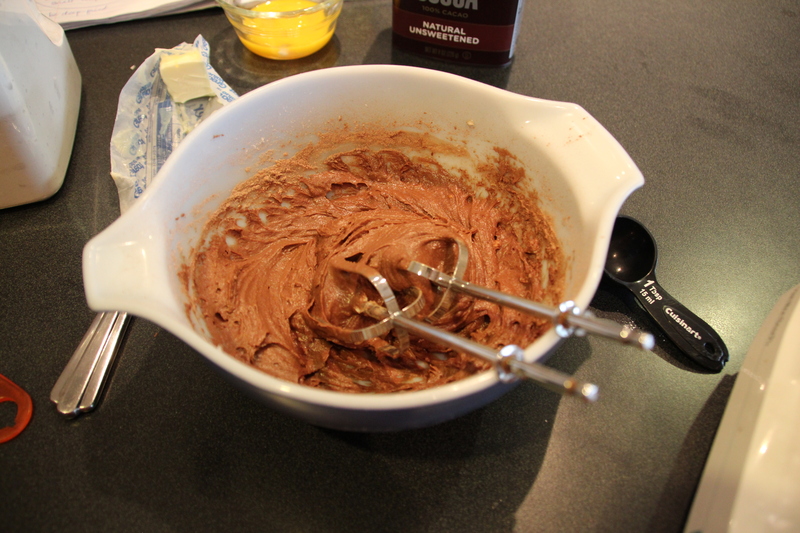 3) Add all the ingredients to a large bowl and mix well. Shape into small balls, about golf ball size. 4) Heat a griddle on medium heat and spread a teaspoon of oil on it. 5) Flatten the potato balls on your palms and shape into a disc. Place on the hot griddle and cook both sides on medium heat till golden brown. A week into summer break, and I’ve already heard “Mom, can we go to the pool?”, “Mom, can we go get ice-cream?”, and “I’m Bored! !” more times than I can take. I had my 10-year old make a list of all the things he would like to do for fun over the next two months, and making popsicles was one of the first few items. We’re checking off one item on the list each day, and yesterday happened to be the day we pulled out the popsicle molds from the basement. But let me be honest; I foresee many days where screen time is going to be my best friend :). 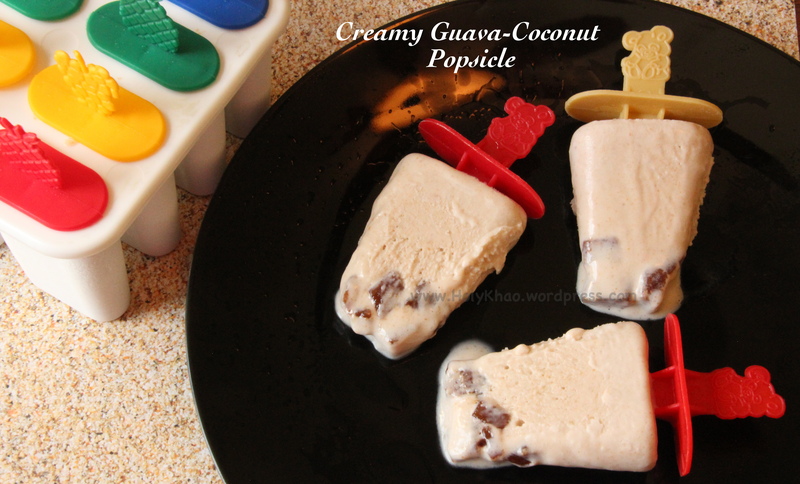 I got this paleta – Latin American popsicles that are either cream or juice mixed with fruit – recipe several years ago from my friend Nellie, and had really enjoyed the taste. I meant to share it here earlier, but had misplaced the hand written scrap of paper. After looking everywhere, I found it folded and tucked inside one of my many recipe books and binders. 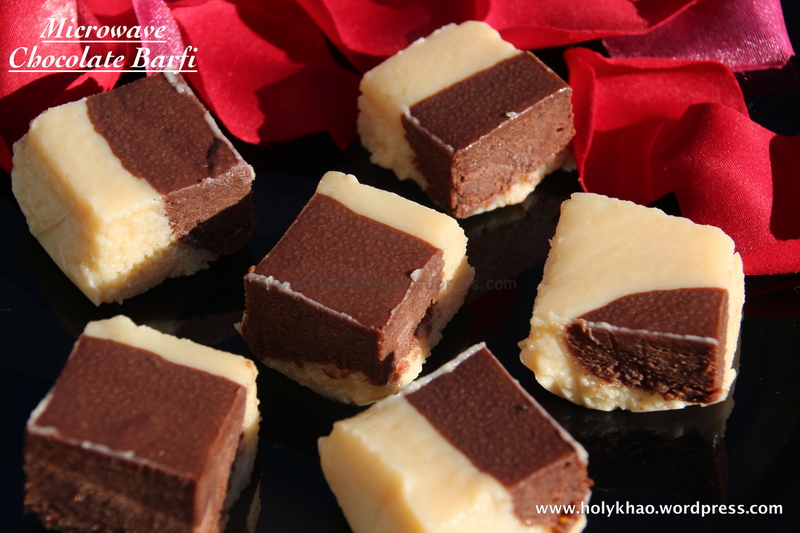 One of my most favorite recipes, these are creamy and just sweet enough. I’ve been inspired to use this basic recipe to substitute other fruits, and will update here once (if) my experiments are successful. 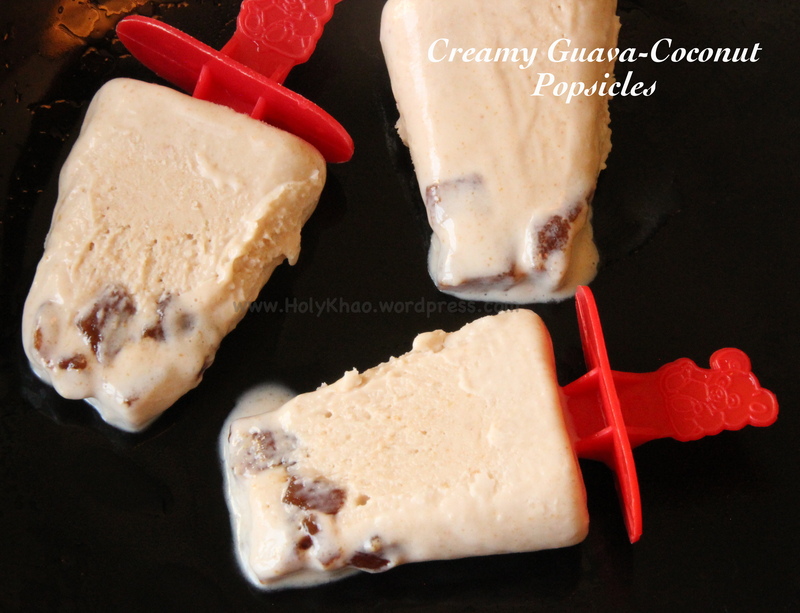 1) Chop about a quarter of the guava paste into small pieces and drop into the bottom of the popsicle molds. 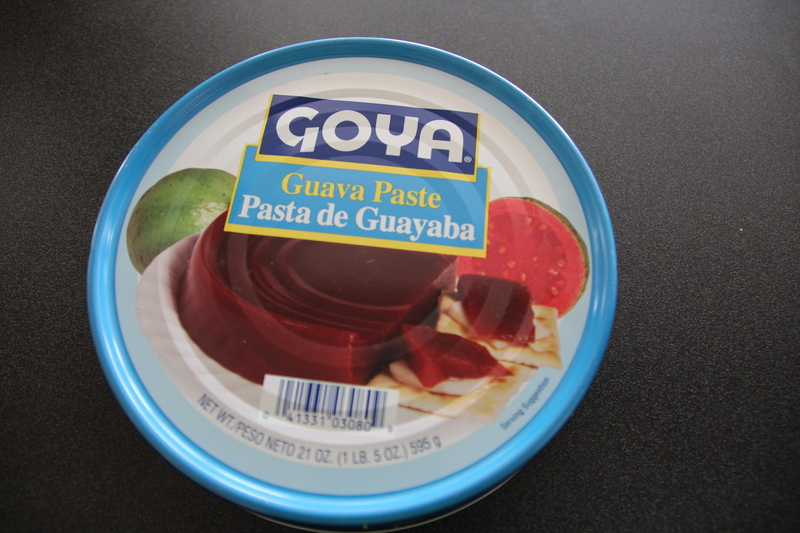 2) In a large blender jar, add the coconut milk, cream, milk, cornstarch, condensed milk, & chunks of the remaining guava paste. 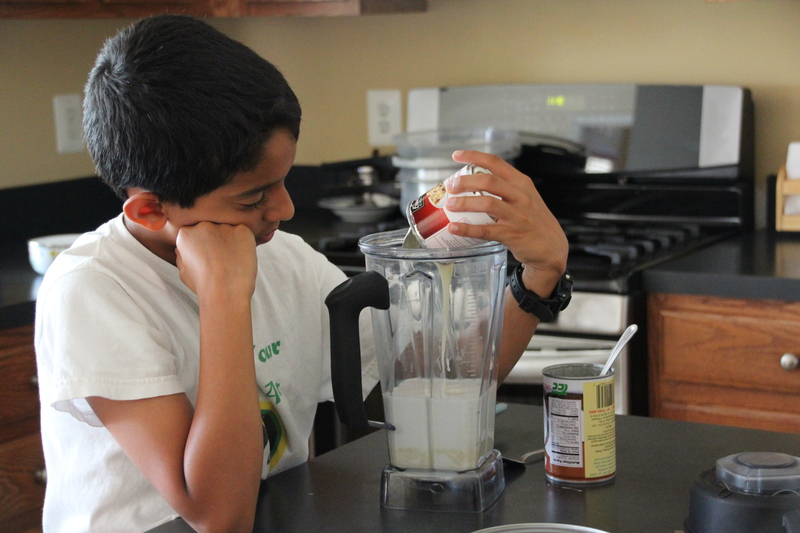 Blend till well mixed, but not frothy. 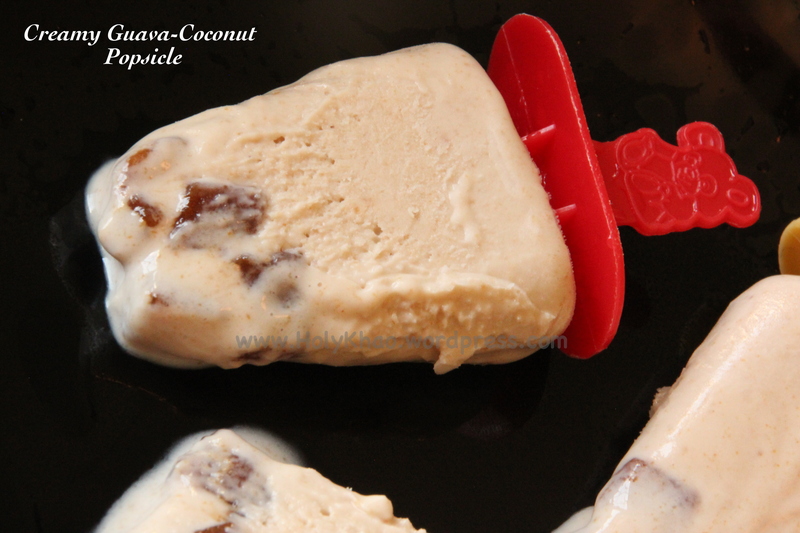 3) Pour into the popsicle molds, add handles and freeze for atleast 4-6 hours. 4) To remove popsicles, run the bottom & sides of the mold under warm water for a few seconds and slide the ice cream out. 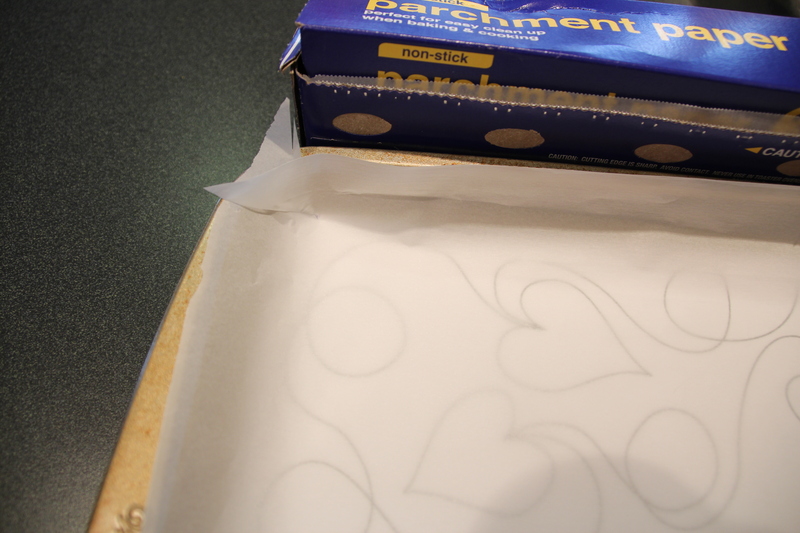 NOTE : If using dixie cups, place them on a cookie tray or plate and then fill them according to instructions. Freeze on the cookie tray for about an hour. Then insert the popsicle sticks. This will help keep the sticks straight as they freeze for several more hours.